We saw the Asus MeMo Pad leaked along with a price range before, but now the company's affordable 10-incher got official at the Thailand Mobile Expo. Just as the speculation we have a 10.1″ WXGA screen, 1.2 GHz quad-core Tegra 3 processor, 1 GB RAM, 16 GB memory and microSD card slot, as well as a 5 MP camera on the back. 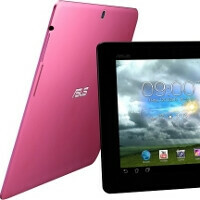 The whole system runs Android 4.1 Jelly Bean, and the full name is now Asus Memo Pad Smart, coming in blue, pink and white colors. The most pleasant part of the 10-incher is the price, as it will hover in the $360 ballpark, which may translate to $400 for Europe when it gets showcased at the MWC expo, still one of the most affordable brand name 10" Android slates. I still think its absurd to release a new product when you already have the tf300 tab. However, the display in the photo has pretty nice saturation. Maybe these memo pads don't have the issues of the transformer series? Looks like a 10" nexus 7 with the addition of a back-camera. hello?? Did you read the words AFFORDABLE? They already released the tf700 with the HD display you know..